Back to Basics. What's THAT Weed? The first step in developing an effective weed management program is being able to properly identify the weed species that are infesting a field. But why? Why is weed identification so important? Simply stated, because not all weeds are created equal. Species differ with respect to their emergence timing, life history traits, competitive interactions with the crop, potential to harm livestock, and sensitivity to available herbicides, among other characteristics. Consequently, the type and timing of weed control events need to be designed to target problematic species so that control is maximized, weed seed return to the soil seedbank is minimized, and crop yields are protected. Unfortunately, weed identification is not a simple task, especially when it comes to members of the Asteraceae, one of the largest plant families in the world. 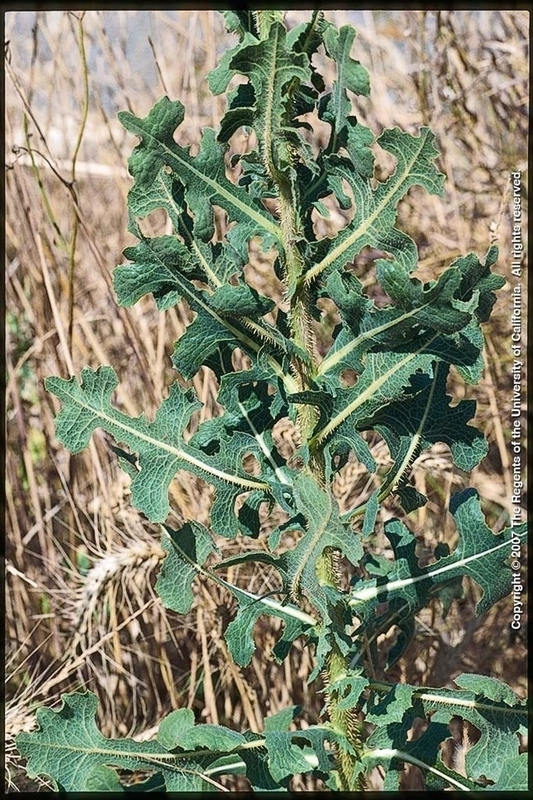 Several species of Asteraceaeare found throughout California in many different agricultural and non-agricultural environments; these include: hairy fleabane (Erigeron (Conyza) bonariensis), horseweed (Erigeron (Conyza) canadensis), annual sowthistle (Sonchus oleraceus), prickly lettuce (Lactuca serriola), and common groundsel (Senecio vulgaris). This blog post has been developed to help you distinguish among these species. 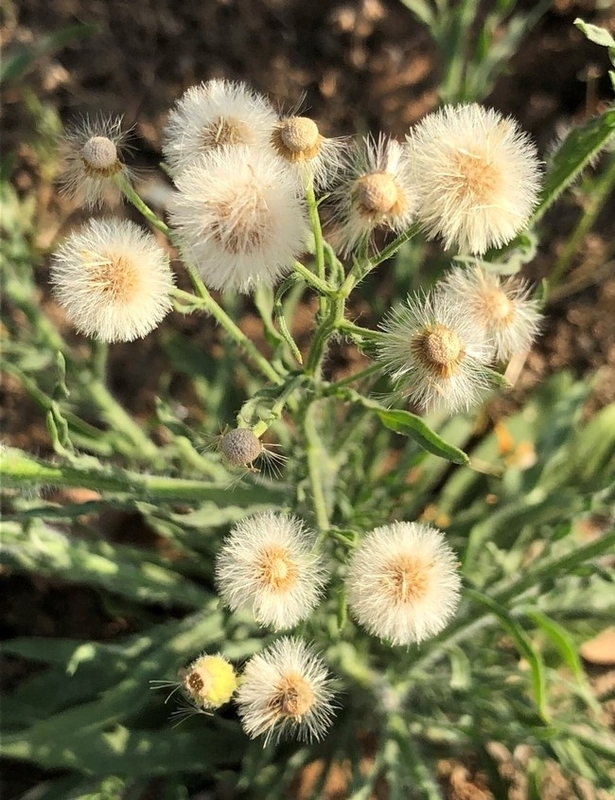 Hairy fleabane (also called asthma weed and flax-leaf fleabane)is an annual (sometimes biennial) herb that is not native to California. According to the USDA's PLANTS database (https://plants.usda.gov), the species can be found in California, Arizona, Nevada, Oregon, and Washington, and across the southern US to as far north as Virginia. Biotypes of fleabane can emerge fall through spring with the earlier emerging plants over-wintering as rosettes. Leaves are a grey-green in color, hairy, and are arranged alternate to each other up them stem. While the first leaves produced are roughly oval- to spatula-shaped, later leaves tend to be more linear with entire to weakly-toothed margins. Leaves of hairy fleabane are also twisted, crinkled or wavy in appearance. 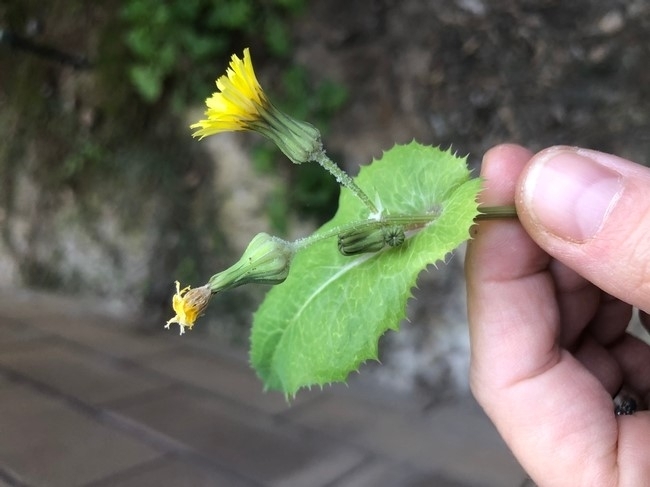 At bolting, hairy fleabane produces a many branched stem (0.5 to 3 feet [0.15 to 0.9 m] in height) upon which numerous cream- to yellow-colored, urn-shaped flowers are held. Lateral branches can be longer in length than the main stem. Flowering occurs, predominantly, mid-summer through fall. The resultant seedheads resemble those of dandelions, although they are much smaller in size (0.2 to 0.3 inches [5 to 7 cm] in diameter). Individual seeds possess a pappus (0.12 to 0.16 inches [3 to 4 mm] in length) on one end that facilitates wind-dispersal. Hairy fleabane plants produce taproots along with fibrous lateral roots. 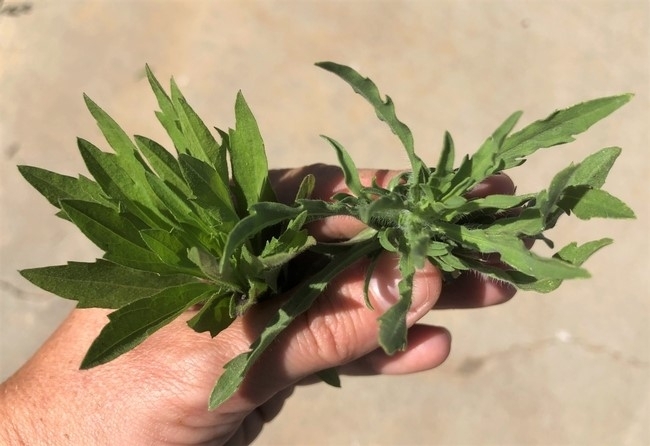 Hairy fleabane populations with resistance to glyphosate and with resistance to both glyphosate and paraquat have been confirmed in California. Hairy fleabane leaves are grey-greenish in color and are often wavy, crinkled, or twisted. Photo by L. M. Sosnoskie. At bolting, hairy fleabane sends up a many branched stem upon which flowers are produced. From: Weeds of California and Other Western States by J. M. Ditomaso and E. A. Healy. Photo by J. M. DiTomaso. Hairy fleabane seedheads. Individual seeds each possess a pappus, a tuft of hair that aids with wind dispersal, which gives the seedheads their fuzzy appearance. Photo by L. M. Sosnoskie. Horseweed, also known as marestail,is an annual (sometimes biennial) herb that is native to California and most other parts of North America. According to the USDA's PLANTS database, the species has been found in all 50 states and most of Canada. The pattern of horseweed germination and emergence is like that of hairy fleabane, were seedlings can emerge from the fall through early spring. 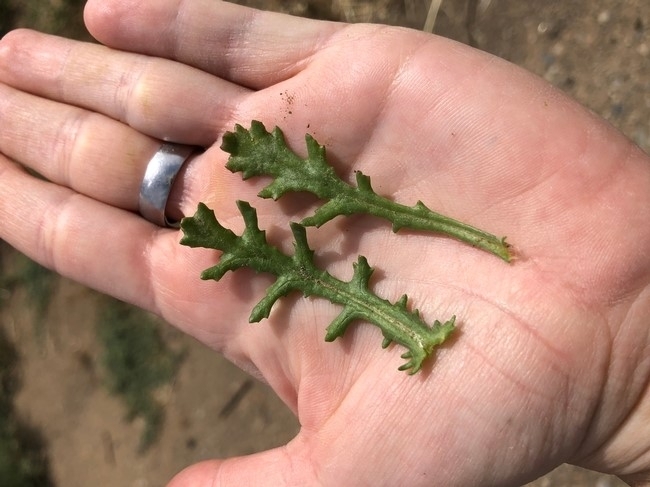 At the seedling stage of development, horseweed and hairy fleabane resemble each other, morphologically; differences become more apparent past the 12 to 15 leaf stage. 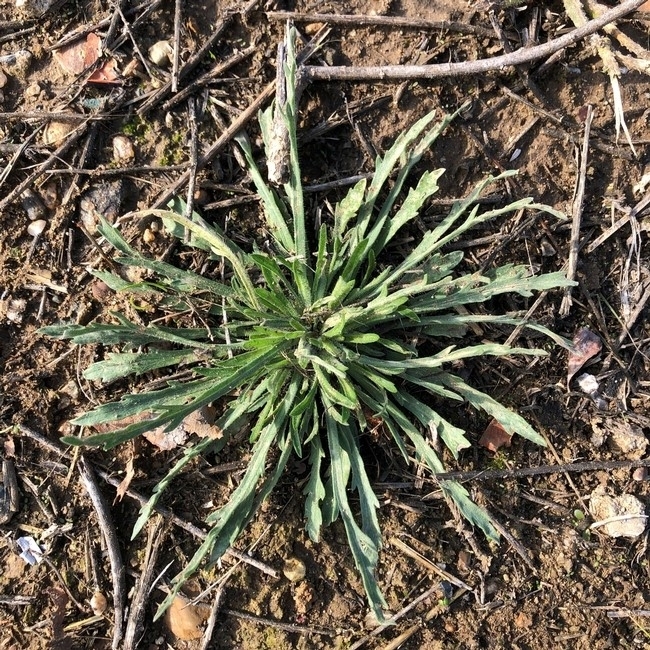 Not unlike hairy fleabane, horseweed leaves are alternate and are arranged in a rosette; however, horseweed leaves are typically a darker shade of green, as compared to fleabane. Upon bolting, plants send up a single, erect stem that can reach heights of 10 feet (3 m). Unlike hairy fleabane, lateral branches are shorter than the main branch. Cream- to yellow-colored, urn-shaped flowers are produced in dense panicles from mid-summer to fall. Like hairy fleabane, horseweed produces seeds that possess a pappus (0.10 to 0.12 inches [2.5 to 3 mm] in length) that facilitates wind dispersal. 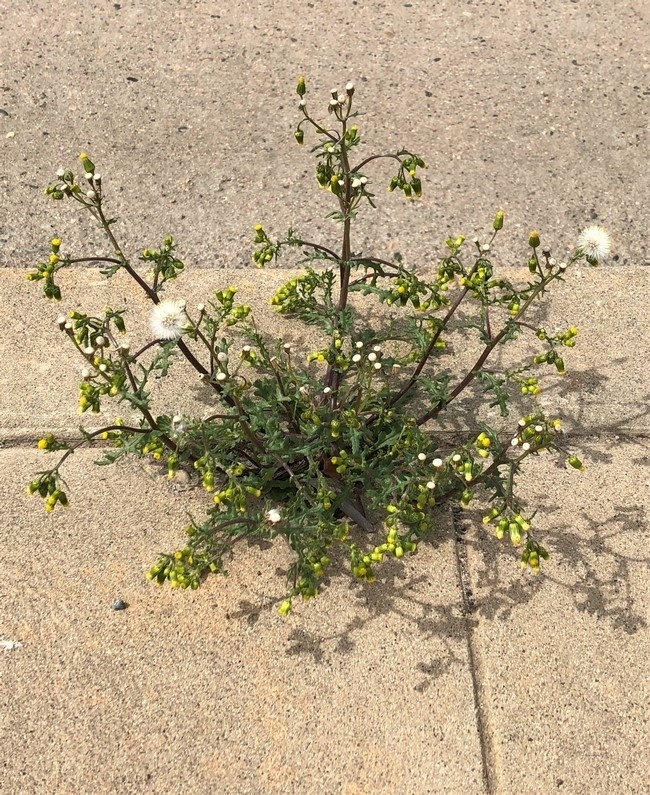 Whereas single hairy fleabane plants have been estimated to produce up to 20,000 seeds per plant, horseweed plants can produce more than 200,000. Horseweed plants produce taproots along with fibrous lateral roots. 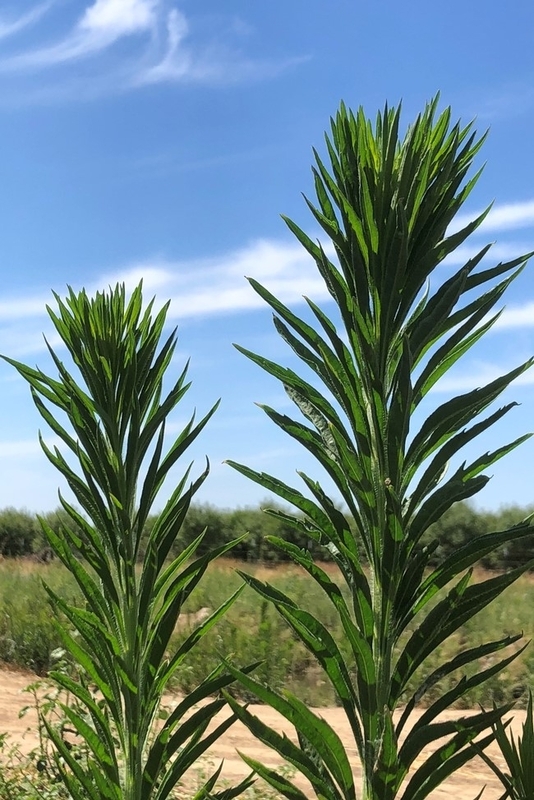 Horseweed populations with resistance to glyphosate and with resistance to both glyphosate and paraquat have been confirmed in California. Horseweed (L) and hairy fleabane (R) rosettes. Hairy fleabane leaves are grey-greenish in color and are often wavy, crinkled, or twisted as compared to horseweed. Photo by L. M. Sosnoskie. Bolting horseweed. Notice the single erect non-branching stem. Photo by L. M. Sosnoskie. Horseweed growth habit. At bolting, horseweed sends up a single, erect stem upon which flowers are produced. 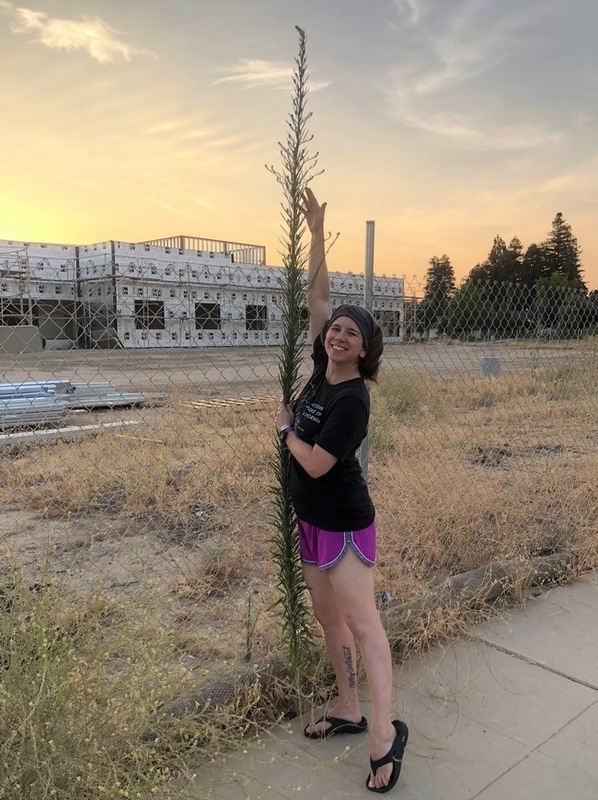 Horseweed stems can reach heights up to 10 feet. For comparison, Lynn Sosnoskie, an author of this post, is 5'3” tall. Photo by D. D. MacLean. Annual sowthistle is not native to North America but has become naturalized throughout the US and Canada. The first true leaf is round to egg-shaped although following leaves become spatulate with prickly margins. Older leaves are deeply lobed with the terminal lobe being large and triangular in shape. Stems are erect and hollow between nodes and can reach heights of 4 feet [1.2 m]. Leaves on the stems are clasping at the base. Broken or cut leaves and stems will exude a white sap. Because annual sowthistle can be both a summer and a winter annual, flowers can be produced year-round when conditions are favorable. Flowers (0.5 to 1 inch [1.2 to 2.5 cm] in diameter) resemble those of dandelions except they are a light yellow in color. Like other species in the Asteraceae family, the pappuses (0.2 to 0.3 inches [5 to 8 mm] in length) attached to individual seeds give the seedhead it's cotton ball-like appearance. Seeds are wind-dispersed. Annual sowthistle produces a short and think taproot with many lateral roots. 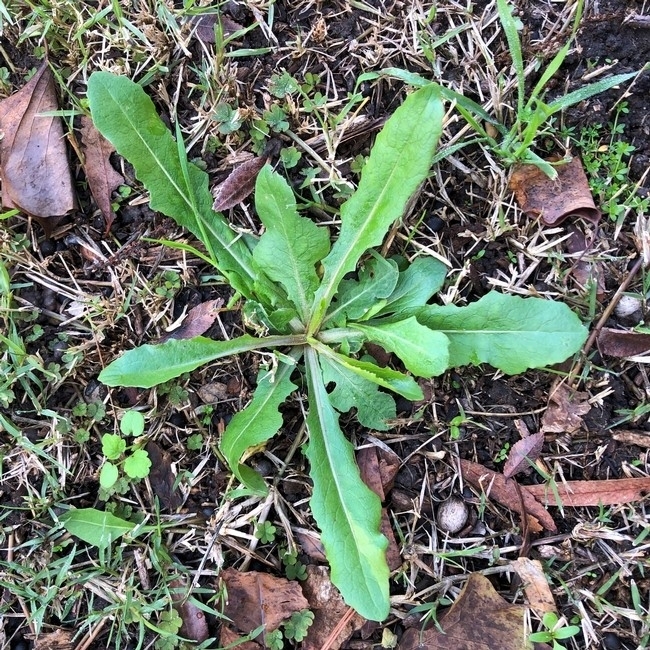 Annual sowthistle seedling. Note the spatula-shaped (spoon-shaped) leaves with finely-toothed margins. Photo by L. M. Sosnoskie. Mature rosette of annual sowthistle. Leaves are deeply lobed with the terminal lobe being triangular in shape. Photo by L. M. Sosnoskie. 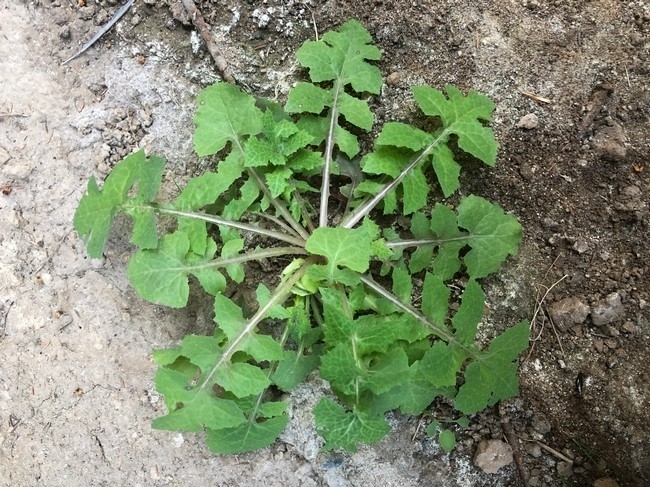 Leaves of annual sowthistle on flower stems are clasping at the base. Photo by L. M. Sosnoskie. Prickly lettuce is not native to North America but has become naturalized throughout the US and Canada. The species is classified as a winter and summer annual and sometimes a biennial. The first leaves are football-shaped; later leaves are elongated and club-shaped with weakly-toothed margins. The midrib vein is pronounced and covered with a row of prominent spines on the underside. Plants exist as a basal rosette (with alternating leaves) before sending up a single flower stalk that can reach heights of 6.5 feet (2 m). The stems are covered with stiff hairs that give them a spiny appearance and are branched at the terminal apex. Leaves that form on this stem can be deeply- and pinnately-lobed with rounded indentations; leaf bases are clasping. Stems and leaves exude a milky sap when cut or broken. Flowers (0.3 to 0.4 inches [8 to 10 mm] in diameter) are pale yellow; flowering occurs, typically, from April to October. Like other members of the Asteraceae, prickly lettuce seeds possess pappuses (0.16 to 0.2 (4 to 5 mm) in length) that facilitate wind dispersal. Plants produce deep tap roots with fibrous lateral roots. 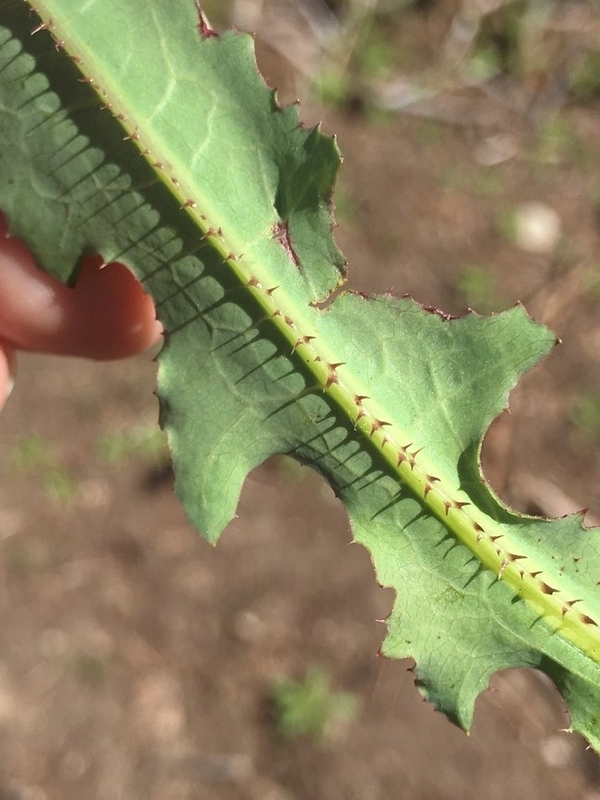 Spines on the underside of the midrib vein of a prickly lettuce leaf. Photo by L. M. Sosnoskie. Common groundsel is not native to North America but has become naturalized throughout the US and Canada. The species is, predominantly, a winter annual and sometimes a summer annual. The youngest leaves are egg-shaped with shallowly-toothed edges, the base of the leaves may be purple on the underside. Following leaves are alternately arranged in a rosette, are usually more deeply (but irregularly) lobed, and may also be hairless to hairy. At maturity, plants may send up a single stem or else a series of branches from the base; stem heights can reach 2 feet (0.6 m). The plant has often been described as having a ‘ragged' or ‘scraggly' appearance. Common groundsel produces small, yellow flowers in clusters. Individual flowers are surrounded by green bracts with black tips. Flowering can occur throughout the year. Like other members of the Asteraceae, a pappus, a tuft of hair that aids with wind dispersal, is attached to each seed. Common groundsel plants produce small taproots with fibrous lateral roots. The presence of common groundsel can be problematic for alfalfa and forage producers; the species produces pyrrolizidine alkaloids, that can lead to liver damage in livestock following consumption. Even hay with a small amount of contamination can be problematic as pyrrolizidine alkaloid poisoning can accumulate in the livestock over months of feeding. Common groundsel leaves demonstrating deep, but irregular, lobed patterns. Photo by L. M. Sosnoskie. Common groundsel at the bolting stage. Photo by L. M. Sosnoskie. Mature groundsel plant displaying a many-branched habit, flowers in clusters, and fuzzy seedheads. Photo by L. M. Sosnoskie. While similar in general appearance (i.e. alternate leaves arranged as a basal rosette, flowers produced on upright stems, and seeds with pappuses that allow for wind dispersal), hairy fleabane, horseweed, annual sowthistle, prickly lettuce, and common groundsel all possess unique morphological and phenological characteristics that differentiate them from one another. 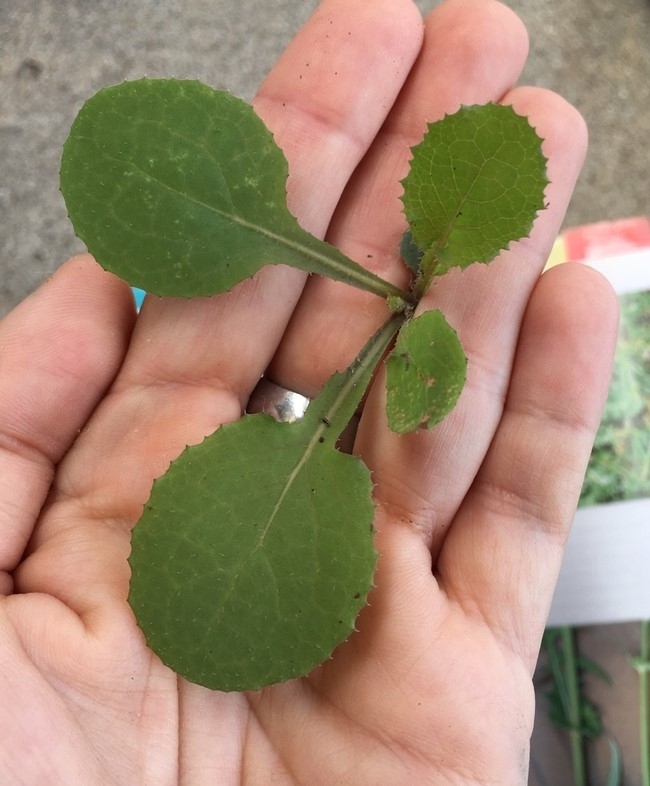 Properly identifying these and other species is the first step in developing a safe and effective weed management program in crop production systems. For example, the type and timing of herbicide applications are directly influenced by the emergence patterns of the target species as well as their sensitivity to available products. For instance, the presence of glyphosate-resistant weeds like hairy fleabane and horseweed may reduce the value of glyphosate as a stand alone active ingredient. Identifying the presence of poisonous plant species is also critical for some producers. 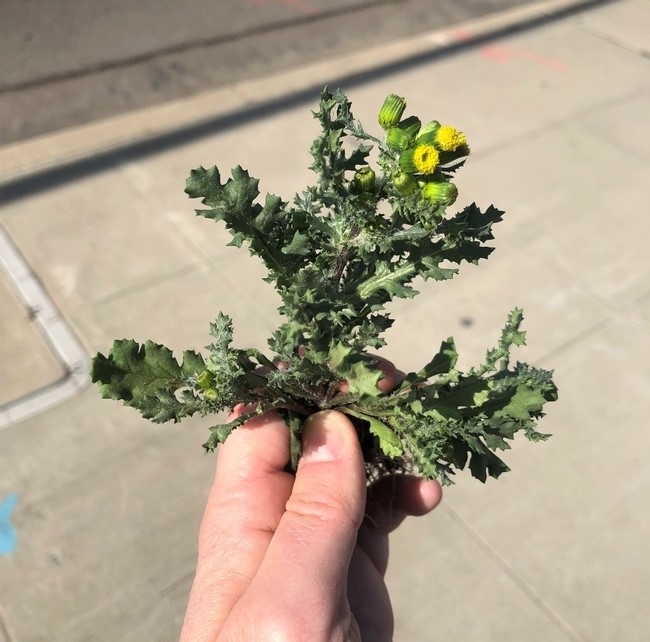 Repeated consumption of common groundsel, can result in irreversible liver poisoning of livestock; consequently, a quick and proper ID of this species is important for limiting animal exposure to toxic alkaloids. Many tools are available to assist growers, PCAs, and other crop consultants with weed identification; this includes the reference materials listed below. Your local county farm advisors can also be an extremely useful resources for determining the identity of suspect species. Great information! I have been trying to identify Asteraceae weeds while scouting for insects so this is very helpful. Helpful article. 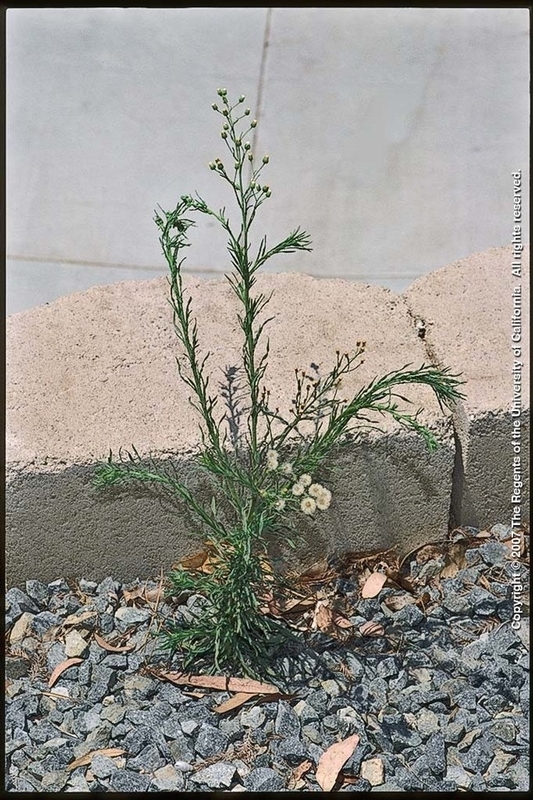 UCANR Publications has a January only special on their Weed ID book!